Several years ago I had an epic debate with one of my best friends about whether people are basically good or bad. He argued that most people have an inherent tendency to act according to their self-interests and that this tendency is the basis for all the corruption, intolerance, and inequity in the world. (Despite how that makes him sound, you should know that he’s lovely–actually one of the most positive and friendly people I know.) I countered his argument with the words of Anne Frank, “In spite of everything I still believe that people are really good at heart.” Yesterday was another exhibit in favor of my case. As I’ve written before, Jordan is tenacious. My sister Lisa jokes that Jordan would make an excellent salesperson because she is a closer. She follows up. She pushes you to specifics. Here’s an example. You might suggest that you and Jordan go out for ice cream one day. She’s going to ask, “when?” You might say, “I’m not sure. Maybe next week.” She’s going to come back with, “how about Tuesday?” If you are skillful enough to dodge a commitment right there and then, you can be sure that she will raise the subject again after a short period of time has passed. Once something is in her head, she will not let up. This lovable and often frustrating character trait has led Jeanette and I to be very careful what we suggest. We couch phrases with, “now, I’m not promising this is going to happen, but…” It’s how we insure against the nagging that is certain to come to us in order to exact a promise. Jordan is always closing. Truthfully, it is part of her magic. The tenacity has saved her life. When she’s channeling that focus and follow-through, she’s practically invincible. Such was my predicament about a month ago. She and I were sitting in the living room watching television together. We were discussing plans for breakfast over the weekend. She offered to get up at 7am and I said, “that’s too early. I’ll still be at SoulCycle.” Her raised eyebrow was the beginning of my fate and the impetus for our day yesterday. Necessary backstory: I reached a tipping point with my own health. My blood pressure was on the rise again, even with medication. At my last physical my doctor made it clear that exercise should no longer be viewed as something that would be nice for me to do. She told me I was too young to neglect fitness, especially given my family history of heart problems. Along with changes in diet, she said there was nothing better I could do for my health than to get more active. My problem is that I hate exercise. Until recently, I never understood all the zealots who preached to me about the power of endorphins. To me, exercise was boring and the time it required could be better used working, being creative, or enjoying time with the family. I’ve tried everything. I’ve jogged. I’ve cycled through gym memberships. I’ve hired countless trainers. It’s never stuck and I’ve never gotten any satisfaction from it. That is, until three months ago when I decided to take a class at SoulCycle. I attended that first class for two reasons. The first was my doctor’s warning. The second was because I study brands for a living and people I trust kept telling me to take a class because I would be blown away by the brand experience. I was. It was in this context, of me ranting on daily about my newfound Soul addiction, that Jordan’s raised eyebrow set a series of events in motion. –Maybe I could go with you to your new gym, Dad. –I don’t think that would work, honey. –Why not? When I was little you took me to the gym. She was right. When she was very little my gym had a daycare center. Once or twice I took Jordan along with me and checked her into daycare while I worked out. But she wasn’t a little kid anymore, and SoulCycle doesn’t have daycare. I tried to explain this to her but I quickly butted up against an ugly reality. SoulCycle is an intense workout. You’re not just spinning. You’re doing crunches and push-ups and lifting weights…all on a stationary bike. While I have seen other parents bring their teenage daughters to a class, there was no way that I could bring Jordan. Forget the fact that I would have a hard time tending to her if she had a seizure, her legs are simply not strong enough to do the workout. And I really didn’t want to tell her this. I hate it when I have to remind her of her limitations. But I did tell her. She said, “oh” and then got very quiet. I felt an inch tall and pregnant with guilt. That’s what drove me to make my next statement. –Maybe I could call the studio and see if we could stop by one day when they don’t have any classes going on. I could show you the studio and the bikes we use. I brushed her off, but she raised the topic again that day … and the next. So, I wrote an email to the general inquiry address on the SoulCycle website. I explained the situation and made the request to visit the studio in the downtime. When Jordan asked the next time I was legitimately able to say, “I sent them an email.” This satisfied her but then she asked me if they had responded. It was still the weekend and I told her it would take awhile. I got a response first thing Monday morning. It came from headquarters in New York. They had already reached out to my local studio and they told me that they wanted to do more than just open the doors for Jordan. They wanted her to experience the ride. 24 hours later they’d concocted a plan and enlisted the service of my favorite instructor. Jordan was invited in for a 15-minute ride with the staff. My argument was being proven again. Even writing this post right now, a day after the event has happened, I get chills. SoulCycle’s offer still moves and inspires me. These were good people, going beyond self-interests to do something wonderful for a kid they didn’t know at all, and a customer who was still relatively new. The big question for me was the ride. I know my daughter and I knew that she would want to climb on that bike. But I wasn’t certain she could … or even if it was a good idea. 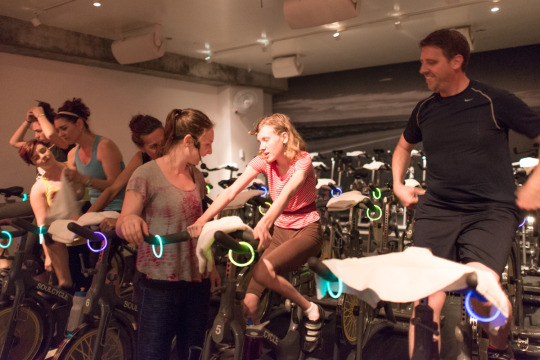 SoulCycle takes place in a dark room with loud music. We’d be pushing Jordan by getting her on the bike. It would be hard to hear her if she felt a seizure coming. I kept thinking the best place for her might be in her wheelchair, observing. But I knew deep down she would never settle for that. We arrived at 3pm to find a throng of people in the lobby. The studio made a big sign that said “Welcome, Jordan.” We greeted everyone and then Jordan met Molly, my favorite instructor. If you don’t know SoulCycle, here’s the deal: it’s all about the instructor. Meet an avid rider and you are certain to hear them rave about their favorite instructor(s). You find one or two who motivate you and it’s easy to start sounding like a fanboy. I’m no exception. In her classes, Molly achieved something I never thought possible. She made me want to come back. I’d leave the studio drenched in sweat and out of breath, but feeling really good. Feeling happy. Maybe this was that endorphin rush everybody kept talking about. I didn’t know. I just wanted to do it again. I’ve actually caught myself smiling during her workouts. Insanity! I was eager for Jordan to meet Molly. But you never know what to expect with J. She can sometimes come across as aloof, usually when there’s a lot to process. She was a little reserved as Molly shook her hand, but that didn’t matter because the next words out of Molly’s mouth were, “you want to see where your Dad’s been going?” Jordan said yes and we were wheeling her into the studio. It was perfect. The lights were out. The candles were lit. All the bikes were staged and ready to go. The folks at SoulCycle even decorated them with little glow-in-the-dark bracelets. As I suspected, Jordan wanted to get on the bike, and Molly encouraged her. So I helped her get into some cycling shoes while Molly got a bike setup. Meanwhile, our friends and the SoulCycle staff filtered into the room taking up positions on bikes to the left and right. Time moved so quickly. Before I could quite process it all I was on a bike to the left of Jordan. She was pedaling. She was riding! Molly cued up some Nick Jonas (a very nice touch!) and started leading a ride just like it was any other class. Five minutes in, Molly ordered us to tap it back, and the professionals cranking on bikes to the left and right complied like it was a gospel choir. The room was electric. And there was no mercy. It didn’t matter that I’d taken a full class earlier in the day with her. Molly singled me out and asked Jordan if her dad should turn up the resistance and push harder. Jordan nodded, of course. Though it was only a 15 minute class, it was a whole SoulCycle experience and just as challenging as the 45 minute version. It was actually more so because I wasn’t focused on my workout. I was focused on Jordan. It was only in reflection, about an hour later, that I truly appreciated how spectacular and special this experience was. I rode next to my daughter in a SoulCycle class! Read that last sentence again. I rode with her, surrounded by friends, and supported by a beautiful community of people. To be completely candid, my stomach was doing somersaults an hour before the class. Though Jeanette and I have always been public about Jordan’s Journey, this was somehow different. In class, you have to let your guard down and focus on the physical challenge. You’re reminded by the instructors to offload all the worries and distractions waiting outside in the world. They tell you that this is your time. It’s intimate. It’s the reason why classes bond together. It’s why the room is dark. It’s why we form that close relationship of trust with the instructor. For the past three months I’ve gone to classes three, four, and recently five times a week–always as a relative stranger. I sit towards the back, where I won’t be a distraction. I don’t have allusions that I’m a good rider. I’m working on it, trying to build up strength, but I know I have a long way to go. This experience changes things. I’m no longer a stranger. I’ve let my studio into my life. What they did is profound evidence that I’m in good hands. But I am also now accountable. I have to push myself and keep up what I’ve started. I have to do it for all of them, for Jordan and for myself. That’s kind of scary. And kind of great. While she might have been cool and coy at the studio that day, Jordan talked about the class constantly until we said goodnight. She worked up quite an appetite, too, wolfing down a well-earned steak a couple of hours later as she and her mother and I reminisced on how powerful the day had been. We’ve been blessed by many emotional steps on these dozen years with cancer. Riding SoulCycle with Jordan is now one of my fondest memories. I am proud to be part of the SoulCycle community and very grateful for the kind, generous and absolutely selfless proof they provided that people are good, and no matter how much adversity we may face we can find hope when we ride together.